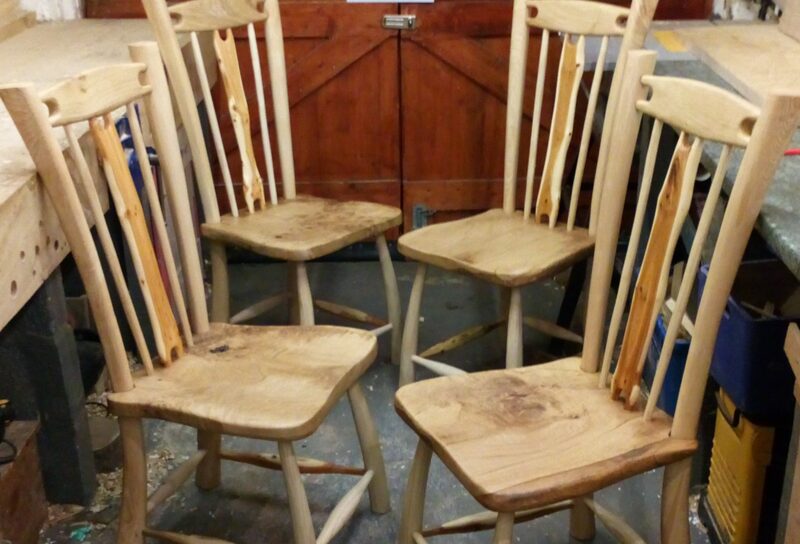 As you can see I have finally manged to complete the first four of six dining chairs. It is very difficulty to decide when to put down the sand paper or oil cloth and there is always more that can be done. It has been a long and quite challenging process and one from which I have taken a great deal. New ideas have been tested and found to work, old methods have been discarded and not missed. I can honestly say that these are the most ‘Little Acorn Style’ chairs I have ever made. I anticipated that the biggest issue would be in making them all ‘look the same’. To this end I developed the system of templates and used a small band saw to cut identical blanks from the seasoned slab wood. From this point onward everything was shaped entirely by hand and I soon stopped worrying about how exactly I was replicating each piece. The joy of green wood working is to allow the material to have its own influence on the character of the finished piece, and this is exactly what I did. The chairs would be ‘a matching set’ but each one unique inits own right. The biggest technical challenge was then to get the geometry of the already individual chairs to be the same. It was specified that two chair seats be approximately 2 cm higher than the others whilst the backs remained the same overall height. The chairs were all assembled individually and the latest chair checked against the previous ones for accuracy. For the first chair several mock ups were made until I had worked out a combination of angles that seemed to give the correct feel and appearance. The first chair was by far the most challenging and set the bench mark for the others. A critical design element was to use only round mortise and tenon joints for all components, the stretchers have two, one at each end, the front legs have two mortises for the stretchers and a single ‘blind wedged’ tenon into the seat. The rear legs have a total of five mortises each, two each for the comb and stretchers and a through mortise for securing to the seat slab. The comb and splat each have four hand carved tenons and it is is these I feel that give the chairs the distinctive appearance that I am very pleased with indeed. 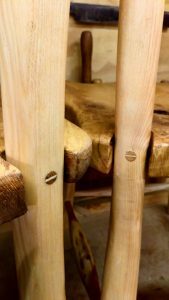 The ash wedges used in the visible oak pegs on the rear legs is also something new for a chair, I have secured table tops in the is way in the past but never with such contrasting materials. Securing the back legs in this way was supposed to be quicker and easier than adding stretchers directly below the seat, I am not at all sure if this was the case. I feel that it is a more elegant and equally robust solution, that I will be continuing to refine and use. So what is actually involved, nearly eighty pieces of wood, all oak, ash and yew from the south Devon area. 16 pieces turned green on a pole lathe for the stretchers, 8 pieces hand carved from seasoned oak for the seats and combs, 8 back legs cut and carved from seasoned ash. 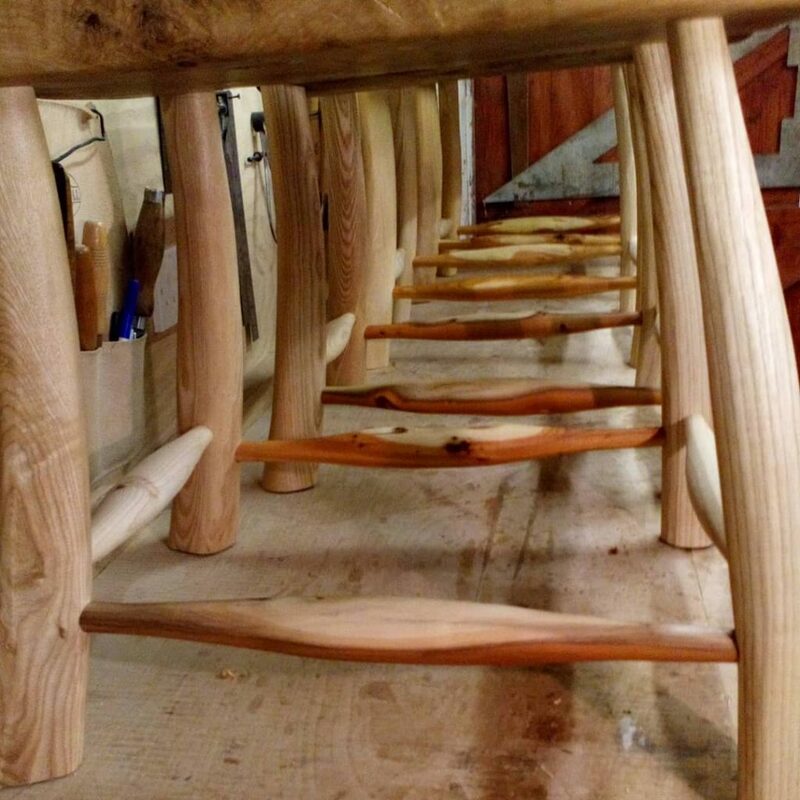 8 spindles and 8 front legs cleft and shaped from green ash. 4 cleft yew splats shaped with draw knife and spoke shave. A total of 16 hand made wedges, eight in ash and eight in oak, and 8 oak pegs. And of course the two butterfly joints used on the first seat. I feel proud to soon be owning these hand made chairs in which so much work has been invested. Thank you they look amazing. We will hopefully enjoy many happy hours of good company and meals sat on these chairs! Previous PostPrevious One of Four! 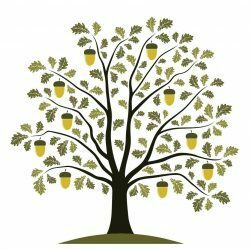 Little Acorn Furniture offers courses in Green Woodworking and rustic furniture making ranging from one to five days in duration. No experience is needed and families are welcome so come along and learn some new skills whilst having a great time. During this one or two day course, you will get to practice the principles of green woodworking: cleaving and shaping the wood using side axe and draw knife before turning on a pole lathe to produce a range of items - as long as it is round! 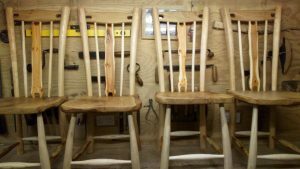 This two-day course offers you the chance to produce a simple three or four legged stool with hard wood top and turned or draw knifed legs. This three day course gives you time to produce a more complex table or bench with stretchered legs using more advanced techniques. The addition of stretchers between the legs allows you to make larger items with more refinement. In order to make a traditional shaving horse you will need a pole lathe, in order to use a pole lathe a shaving horse is essential. Get around this catch 22 situation by making your very own shaving horse over two days in Alasdair's fully equipped Greenwood workshop. 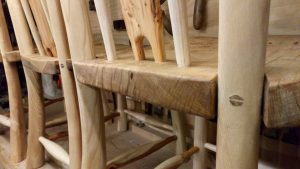 Alasdair will take you through the basic principles of Green Woodworking and provide the knowledge, tools and materials needed to get you using a pole lathe. Turn as many items as you like using a variety of local hard woods and unlock the full potential of this ancient craft. 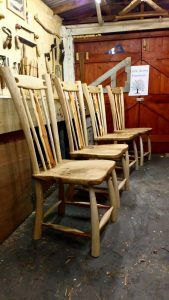 Work and learn at your own pace - receive uninterrupted expert tuition in the art of green wood furniture making and have exclusive access to the range of hardwoods available in the workshop.